Colorado Four O'clock is a member of the Four O'clock (Nyctaginaceae) Family. 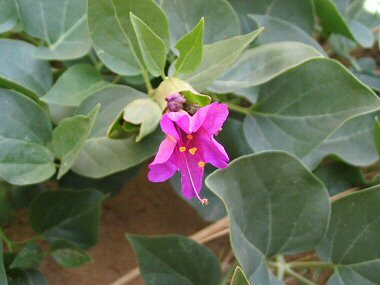 It grows to 2 feet in height and has smooth, oval or heart shaped, dark green leaves which grow to 4 inches in length. 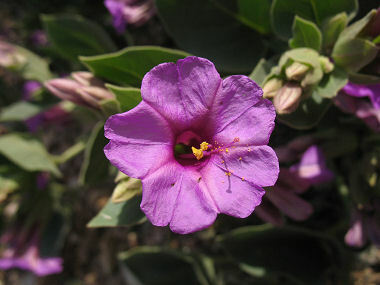 The plant typically grows in clearings along roadsides and in open sandy areas at elevations between 2500 - 6500 feet. The flower of the Colorado Four O'clock open in late afternoon and wither by the following morning. Colorado Four O'clock typically blooms between April - September and produces magenta, funnel shaped flowers to 1 inch in width, followed by a smooth, dark brown 1/2 inch long fruit.